One of the things I strive for in this blog is ease of access to information, be it through the way I use categories and tags for posts or through the use of the available menu options and widgets, etc., within the blog’s theme. Three changes I’ve made through 2018 – which may or may not have been noticed – is to information displayed in the widgets bar on the right of the blog. A section on SL user groups. A section on SL tutorials in this blog. A revised RSS feed from the SL grid status. All three can be found between the Blogroll lists and Tag Cloud. The new / updated blog widgets – all colour items are clickable links. These actually appear one above the next (l-r) in the widgets bar on the right of the blog. SL User Groups: provides direct links to all of the current Second Life user group pages on the Second Life wiki. These pages provide a summary of the purpose of the meetings, the date and times of forthcoming meetings and often, but not always an agenda for the next meeting and / or, where recorded, archives of past meetings. All meetings are open to those interested in attending. I provide summaries of all meetings I attend. SL Tutorials: over the years I’ve provided a series of Second Life tutorials on various subjects. This widget is designed to provide a link to my full index of tutorials (which also includes links to tutorials by others). It also lists key Second Life tutorials I’ve produced either on my own, or with the assistance of Linden Lab (e.g. the Abuse Reports tutorial). I plan to add further relevant tutorials to this selection as they become available, together with what I think are the more interesting of my own tutorials on interesting subjects. RSS Feed: this is tweak to the RSS feed from the Second Life Grid Status page, which hopefully presents updates in a clean, readable manner. Since the introduction of the current blog layout in 2017, I’ve continued to make adjustments to the menu system to try to ease navigation, not all of which I’ve subsequently written about. Most recently, I’ve attempted to simplify the menu structure further by combining a couple of the top-level menus and reducing the sub-menu structure of each. SL (unchanged): provides access to all Second Life posts and pages, divided into the following sub-menus / categories, including news items, opinion pieces, my Exploring Second Life travelogues, all of my SL user group meeting summaries, art reviews, all viewer reviews, etc. LL (unchanged): provides access to general news and information specific to Linden Lab, including all transcripts of Lab Chats and Q&As by Lab CEOs and senior staff. 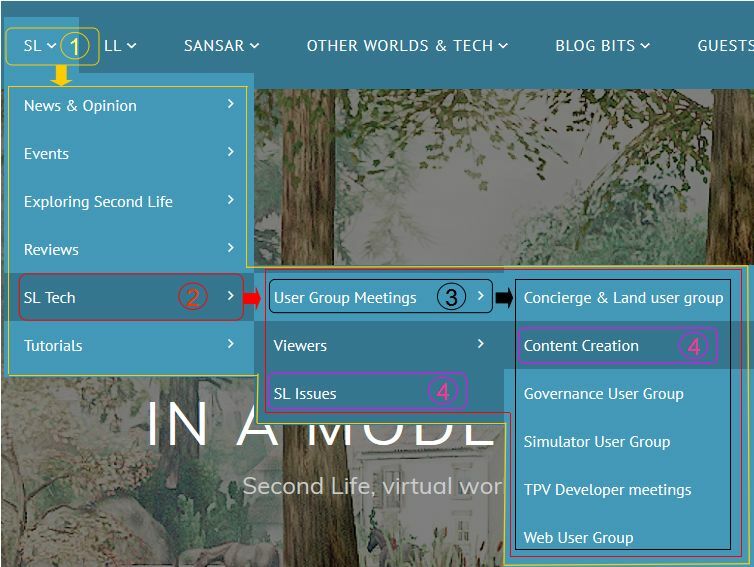 Sansar (unchanged): provides a breakdown of all Sansar-related posts and articles in this blog, again divided into sub-menus / categories. Other Worlds and Tech (unchanged): covers articles on other virtual worlds, AR and VR, pieces on general tech and my Space Sunday astronomy & space reports. Guests (unchanged): provides access to all articles written by guests on this blog, accessed via the writer’s name. Blog Bits (new): this now combines general information on this blog (blog guidelines, blog navigation, privacy statement and my review systems specifications), my “personal” items (biography, SL home life, my blogging journey, my SL videos, etc. ), as shown in the image above. Note that the majority of the menu items in the above options have right-pointing arrow (“>”) indicating sub-menu options can be accessed. However, do please note that all articles for a specific category can be accessed by clicking on the top-level menu / sub-category option, as (hopefully!) explained in the image below. The only exception to this is the About Me item under Blog Bits – just use the sub-menu from this to navigate further. 1. Clicking a top-level menu will display all articles under that topic, as indicated by the yellow lines. 2. Clicking on a topic within a top-level menu will display all articles for all sub-menus under that topic, as indicated by the red lines. 3. Clicking on a topic within a sub-menu will display all articles found under any sub-sub-menus for that topic, as indicated by the black lines. 4. Clicking on a specific topic name without any “>” will display only the articles related to that topic. I hope these changes and updates further help people locate information within this blog. Obviously, the tag cloud can also be used to assist with finding article sets, and don’t forget there are the search options, also found in the right-side widget bar, which include the ability to list post by the major article categories used in this blog, or to list all articles published in a given month (most recent to oldest).